Hi guys! First of all HAPPY NEW YEAR! I hope everyone had amazing holidays. I have updated the gallery with Candid photos of Audrina from 2013. More to come soon! Enjoy! Audrina Patridge was spotted taking daughter Kirra to the pumpkin patch on October 27, 2017. She is embroiled in a bitter split with estranged husband Corey Bohan. But Audrina is obviously not letting the stress of her failed marriage affect her relationship with daughter Kirra. The two picked out pumpkins together, and petted baby goats, before taking a ride on a mini tractor at Tanaka Farm, just outside Los Angeles. 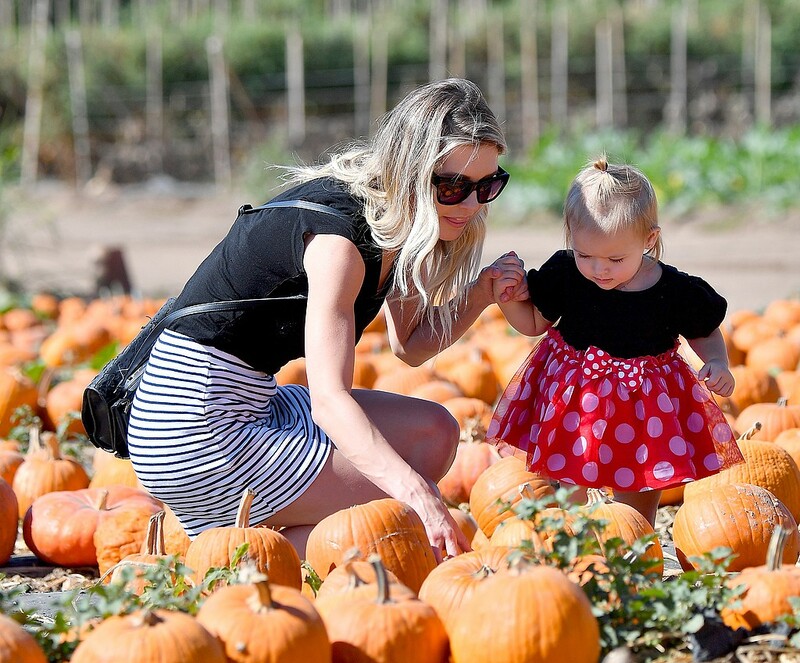 Kirra, 16 months, was dressed as Minnie Mouse for the outing, Audrina wore a striped dress. Another day in Miami, another day at the beach! Audrina Patridge was spotted getting her tan on again on July 26, 2017. Audrina was wearing a super cute mismatched two-piece from her own collection. A high-waisted navy and white gingham bikini bottom from her Prey Swim line that had cutouts and a tie in the back. Audrina Patridge was spotted at the beach in Miami on July 23, 2017. Audrina chose a deep teal bikini that showed off her tanned beach body, also revealing her toned tummy. The teal bikini, which is from her collection, has ruched detailing on the back, allowing the svelte star to show off her pert assets. Audrina Patridge was spotted out in Miami setting up her swim line fashion show at SWIMMIAMI on July 20, 2017. I will upload photos of her during her fashion show later today! Audrina Patridge attended the SIMPLY Los Angeles Fashion + Beauty Conference on July 15, 2017. Audrina looked stunning in a red pattern dress at the event where she was one of the speakers.